Tools make powerful gated offers for your digital marketing campaign because they often deliver value much faster than educational gated offers. Although white papers, reports, and case studies require someone to invest time in order to receive value, a tool is often immediately useful. Though similar to a free report, both handouts and cheat sheets provide a different value to prospects. A handout or cheat sheet is generally short (one page or so) and cuts straight to an ultraspecific point, making the information easily digestible. You can deliver handouts and cheat sheets as checklists, mind maps, or “blueprints,” to name a few examples. Here’s an example of a handout as a gated offer. A handout is a prime example of useful content that can be gated. If people are learning to do something that you’re an expert in, chances are they’ll want to know what tools you’re using to get it done. This type of gated offer makes a list of tools or resources (be it of apps, physical products, hardware, or other items) available to the new lead or prospect. The toolkit or resource aggregates the list so that the lead doesn’t have to keep searching for more information. A template is the perfect example of a proven, well-tested shortcut to better results and can make a tremendous gated offer. A template contains a proven pattern for success that requires less work on the part of the person using it. It might come in the form of a spreadsheet preconfigured to calculate business expenses. Or it can be a layout for designing a custom home. Templates make powerful gated offers because the prospect can put the tool to immediate use. Software can work well as a gated offer. You might, for example, offer full access to a free software tool that you developed or a free trial (that lasts for 14 days, perhaps) of your software in exchange for an email address. Software companies often offer a free trial of their software as a gated offer. A software gated offer can turn a lead who is on the fence about purchasing the product with a risk-free means of acquiring it, while also providing the company a way to follow up with that lead. Discount and coupon clubs offer exclusive savings and early access to sales. This is an effective type of offer that acquires contact information and allows you to continue the conversation by reminding members of specials and rewards available to them. Quizzes and surveys are fun and engaging for people to take and can be a great way to generate new leads. For instance, a beauty company might offer a “What’s Your Skin Type” quiz. These types of content are intriguing to members of your market because they want to know the results of the quiz or survey. To obtain the results of the quiz or survey, the prospect must first opt in by entering an email address. If the quiz or survey results provide value to your market, this type of gated offer can be powerful. You can develop a gated offer that assesses or tests prospects on a particular subject. At the end of the assessment, offer prospects a grade and information on actions they can take to improve their grade, which would likely be a tool or service that you provide. For example, this assessment can serve as a rubric for grading a blog post. 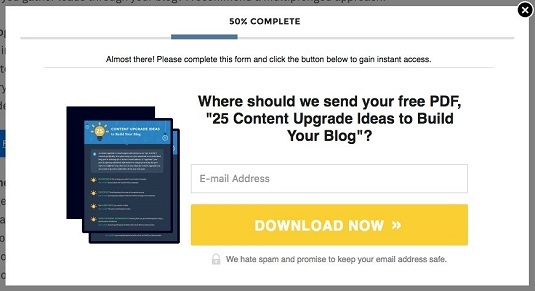 This image shows an assessment offer that has been generating leads for HubSpot, a company that sells marketing software, for years. Leads can use the assessment from HubSpot to grade their marketing and make it better. 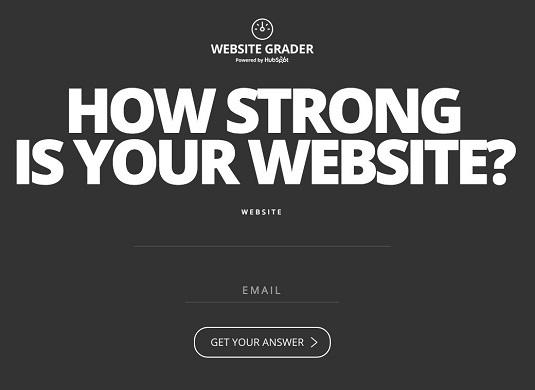 HubSpot generates leads with its gated offer of its “Website Grader” assessment.